If you are injured in a car accident, there is a good chance you will learn that the other driver has State Farm. According to the business, it insures more vehicles and homes than any other insurer in the U.S., and it is the leading insurer in watercraft. As of the end of 2016, its policies and accounts amounted to more than 84.4 million. Considering its size and reach, it is not surprising when an at-fault driver hands over a State Farm insurance card. However, you should not let State Farm’s presence in your accident give you comfort just yet. Whenever you deal with a major auto insurer after a crash, you need to have a Miami State Farm insurance lawyer by your side. Our attorneys at Gerson & Schwartz P.A. have years of experience handling car accident claims and working with State Farm insurance adjustors. State Farm was founded by George Jacob Mecherle in 1922. Better known as G.J., he was a retired farmer and insurance salesman, and his goal was to provide the best for his customers. G.J. originally offered one line of auto insurance. Over the years, State Farm has grown to five lines of business, numerous subsidiaries, and approximately 100 products and services. It now has more than 70,000 employees and 19,000 agents. While State Farm and its jingle, “Like a good neighbor, State Farm is there,” are well-known throughout Florida and the U.S., the company is not without its detractors and controversy. An investigation by CNN in 2007 uncovered that many major car insurers, including State Farm, were fighting insurances claims involving injuries more and more often. As of 2018, there was also an on-going class action lawsuit against State Farm regarding its alleged use of non-original equipment manufacturer (OEM) certified parts after vehicle accidents. 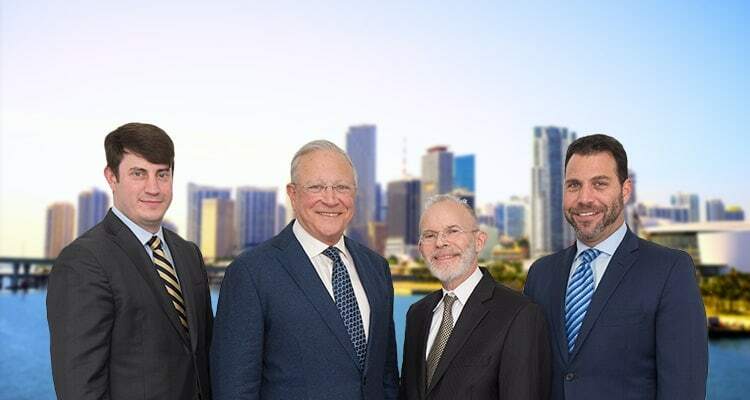 Given the likelihood of the insurer fighting your insurance claim and the possibility of deceptive or unfair tactics, it is important to work with our State Farm insurance lawyers of Miami. We are highly experienced in dealing with an auto insurance company after an accident. If you are in a car accident and either you have State Farm insurance or the at-fault party does, you may need to file a claim with State Farm. You can do so online, through the State Farm mobile app, by calling your agent, or by calling 800-SF-CLAIM. Once you make a first-party or third-party claim, an insurance adjuster will be assigned. This adjuster is responsible for investigating the accident, gathering evidence of what happened, approving or denying your claim, and negotiating your settlement. During the investigation, State Farm will request information and documentation, including the police report of the accident. You may be asked to provide a statement. State Farm may also request your medical records, but be careful. You may be asked to sign a waiver, which would give State Farm the right to look at your entire medical record from long before the accident. Always speak with a Miami State Farm insurance attorney before signing anything. By hiring an attorney from Gerson & Schwartz, P.A., you have someone to protect your rights during the insurance claim process. We will ensure that State Farm receives all of the information and documentation it needs, including the appropriate medical records regarding the injuries you suffered in the accident. However, we will not let the insurer unnecessarily dig into your medical history to try and deny your claim or limit your compensation. We will not let an adjuster intimidate, manipulate, or coerce you. If we notice any signs of unfair or deceptive tactics, we will immediately seek to remedy the situation. If your claim is wrongly denied or State Farm refuses to appropriately negotiate your compensation, then we will explain your legal options. In certain situations, we may need to file a personal injury lawsuit. This case is important if State Farm refuses to negotiate a settlement. However, we may not wait to see how your claim goes. We may file a personal injury suit on your behalf right away in order to show the insurer we are serious, to participate in discovery and gather evidence of the crash, and to put pressure on the insurer to negotiate for a fair settlement amount. If you were injured in an accident and must deal with State Farm, let one of our experienced and skilled car accident lawyers help you recover the maximum compensation you deserve under the law, including for your medical expenses, lost wages, pain and suffering, and more. Whether you have filed a first-party claim under your own State Farm comprehensive coverage, a third-party claim against the other driver’s bodily injury policy, or you are in some other situation, we are here for you. We will protect you during the insurance claims and legal processes and fight for your right to compensation. Call us at toll free at (877) 475-2905 or at our Miami office at (305) 371-6000 to schedule a free consultation.